Zindagi - Jodey Dilon Ko brings to you yet another drama that will make your hearts flutter. ‘Mere Humdum Mere Dost’ an upcoming tv serial on Zindagi .Originally this Serial was aired on Urdu 1 in Pakistan.The show was very popular in pakistan. 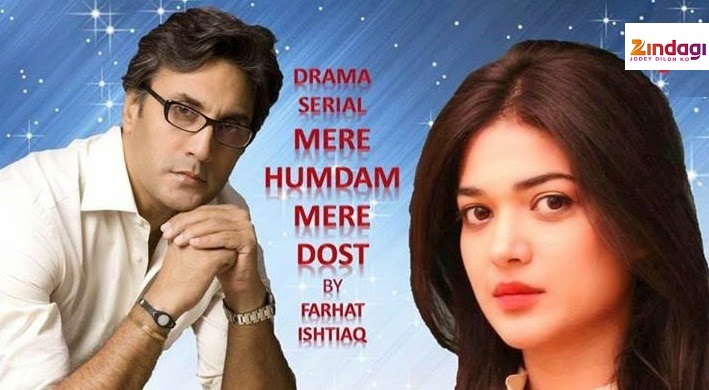 ‘Mere Humdum Mere Dost’ is based on Farhat Ishtiaq’s novel of the same name. It is the story of the journey of a woman who blossoms when she finds love. The show is about Aimen (Sanam Jung), a 20-year-old girl raised by her mother Zainab in absence of her estranged father Taufeeq. Aimen unfortunately loses her mother and has to go live with her father. But, he too, is unable to take her in as he has to leave the country. Taufeeq requests his business partner Haider to take his daughter in to which he willingly agrees. In Haider, Aimen finally finds a friend and a mentor who not only helps her cope with her loss but also grooms her to become confident and independent. During the process, both develop a fondness for each other. However, in a twist of misfortune, Haider’s ex-wife returns and expresses a wish to remarry him. The OST is composed by Waqar Ali and is sung by singers Nida Arab and Adeeb Ahmed. The song was well received by the audience.